Learn what's on the test - before the test. Find the details in our exam prep guides. Differentiate yourself and/or your business by attaining a certification based on one of our new technologies. Validate your skills and knowledge. 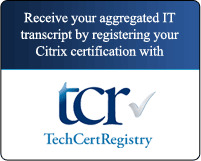 Prove your expertise by attaining a Citrix certification. Take an official certification training to prepare for your exam. Learn from the best while using the best content and labs. Citrix and Pearson VUE charge a fee for those candidates who choose to use either the Pearson VUE call center or one of our test center partners for their test registrations, cancellations, or reschedules. Using these services over the web will not attract these service charges as web services do not have the higher associated cost of maintaining offices and staff.